The self-renewing bird is one of our most enduring myths. Enter Joseph Nigg, perhaps the world’s sole phoenix scholar. He’s author of The Book of Fabulous Beasts: A Treasury of Writing from Ancient Times to the Present—and is known as the Joseph Campbell of fantastical animals. Nigg is writing a book about the phoenix and was just finishing chapter 19 of 20 when I called his home. gan in ancient Egypt and Arabia. The fabled bird is said to live 500 years or more, and when the old bird is tired, it flies from Arabia to land in Heliopolis, Egypt, the “City of the Sun.” There, it gathers cinnamon twigs and resin to build a nest of spices atop the Temple of the Sun. The sun ignites the nest and the old phoenix dies in flames. A new, young phoenix emerges from the ashes and wings back to Arabia to live another life cycle. The bird’s features have changed over the centuries, but most agree it’s an eagle-like bird with shining red, golden, and purple plumes. The tale may have evolved from the Egyptian Benu, a sacred bird mentioned in the Book of the Dead that is associated with the sun god Ra and looks like a heron in hieroglyphics—or it may have been mistaken for a cousin by Egyptologists overeager to make a connection. The phoenix—a Greek word meaning “reddish-purple”—turns up first in a riddle by Hesiod. Themes of time and longevity suggest the bird was already well known to those trying to solve the riddle. Although he lived two centuries later, the Greek historian Herodotus is credited with introducing the legend of the phoenix into Western culture after his travels in Egypt. In his famous Histories (fifth century BCE), Herodotus tells of many new, fantastic beasts, including the crocodile, hippopotamus, and phoenix. Herodotus visits Heliopolis and talks to the temple priests: “They have another sacred bird called the phoenix, which I have never seen, except in pictures. Indeed, it is a great rarity, even in Egypt. They tell a story of what this bird does, which does not seem to me to be credible.” This early Greek version of the phoenix has no fire. Romans loved the phoenix. Their coins showed the emperor’s head on one side and the phoenix on the other. “The phoenix represented Rome itself, the eternal nature of the empire, that it continues to return with each new emperor,” Nigg says. 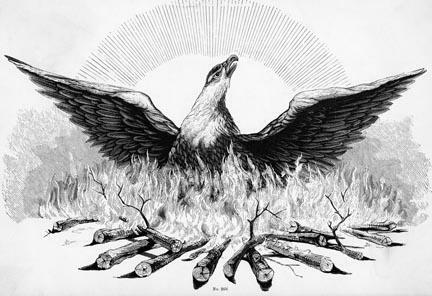 Despite its strong Christian associations, the phoenix also appears briefly in Jewish tradition. The Talmud tells how the phoenix (Hol) was the only animal allowed to stay in the Garden of Eden, because it refused to eat the forbidden apple. God granted the bird immortality for its obedience. folklore. Swarthmore Professor of Russian Sibelan Forrester says Slavic lore hosts two mythical birds, the traditional firebird (star of Stravinsky’s ballet) and Finist the Bright Falcon, whose name is derived from the Greek phoenix. The Chinese phoenix Feng Huang (Ho-o in Japan) is a completely separate bird dating back at least 7,000 years. This celestial fowl became entwined with the Western phoenix through Scottish sinologist James Legge, who translated Chinese classics in the 1800s. His word choice persists, even though the Eastern bird has no fire, never dies (so is never reborn), and looks like a pheasant. Its very name represents the union of yin-yang, with “feng” being male and “huang” female. When paired with a dragon, the phoenix represents the empress and the dragon the emperor. This auspicious pairing also symbolizes good luck and harmony between husband and wife. rom the hot salt flats where it laid its eggs, perhaps suggesting a nest of fire. But like its legend, the phoenix enjoys a modern rebirth as a mascot, logo, and fairytale. 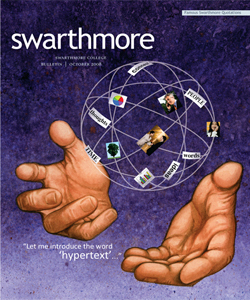 Swarthmore is not alone in seeking a symbol of renewed life and hope after devastating fire. Cities including Atlanta; San Francisco; London; and institutions in Chicago and Coventry, England, have each adopted the phoenix. Its namesake, Phoenix, Ariz., reminds modern Americans that the city stands on the same site as a vanished Native American civilization. Before becoming a freelance writer two years ago, Heather Shumaker ’91 was a conservationist working for a nonprofit land trust in Michigan. Mother of two young boys, she has written for Parenting, Organic Gardening, and Pregnancy magazines; the Wisconsin Natural Resources Journal; and Traverse. Inspired by her research for her current Bulletin article, she says, her most recent Halloween costume was a phoenix.